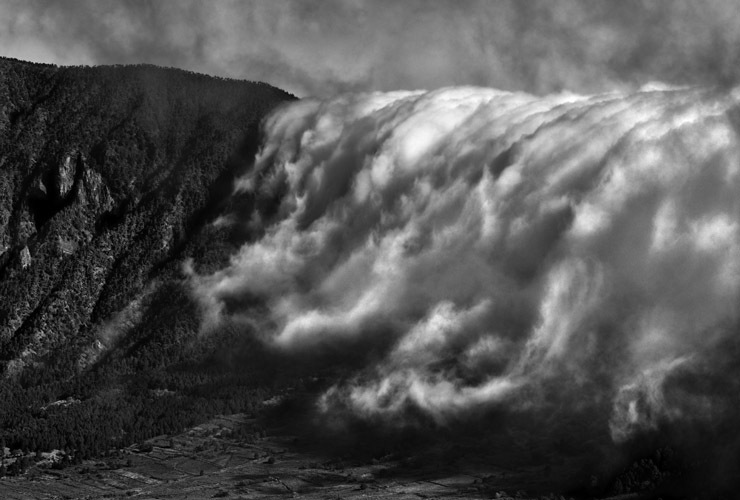 Any guesses where this photograph by German photographer Peter Schlör was taken? Any of my British friends recognize a popular summer holiday destination? I recently came across Peter Schlör’s book ‘Black and Wide‘, a collection of very moody black and white photographs that if you’d told me were of the Pacific Northwest I would have believed you. But no, they were taken on the Canary Islands. I couldn’t believe it. When I think of the Canary Islands I think of it as a summer destination, the ocean, blue skies & bright colors. What you’ll find in these pages are images with very dark shadows, trees, fog and low clouds. It’s an amazing transformation. I’m looking forward to finding out more about Peter’s work. I was pleased to find the video below of Peter and the team getting ready for an exhibit of the Black and Wide images but very disappointed to find out that it was all in German. Anyone able to help out with a translation? In any case, it was interesting to see how the images were prepared for exhibition. This is one of the things that you miss out on when looking at images in a book, the scale of the final prints. It was interesting to see what an eclectic mix of sizes and presentation styles that were used and it makes me wonder why he made the choices he made. Worth a look even if you don’t speak German! I’m reading a book of Gerhard Richter’s letters at the moment. 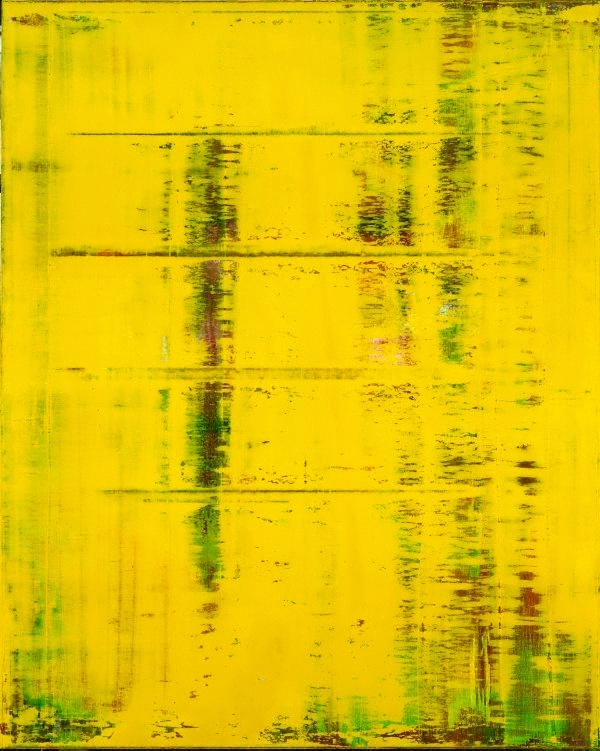 It’s imaginatively called ‘Gerhard Richter: Writings 1961 – 2007‘. I’m not sure what the best way to read a book like this is and I’ve found myself reading whatever catches my eye rather than sticking to strict chronological order. Having read pieces from the early ’60s and also the early 2000’s it’s interesting to see that his interviewers still tie him back to statements that he made as a younger artist and that while he still supports his original position he has clearly moved on, become more sophisticated and nuanced in his thinking. I suppose it’s natural for people to continue the connection to who you were, even when you’ve moved past that stage but it would drive me insane. I also recently came across what was to me at least a new documentary of Richter at work. His abstract work particularly appeals to me and I found it interesting to see how they’re are created, destroyed, reworked and made over again. I must admit that there was a point where I was happy with the painting that he’d created, would have been quite happy to see that hanging in my office, and then he was off again with the squeegee. Nooo! I’ve been taking a deep dive into the world of a couple of different painters over the Christmas holiday. The first that I wanted to share here was Gerhard Richter. For much of Richter’s early work he used photographs as source material. Many of these source photographs can be seen in Richter’s scrapbook of source material The Atlas. Some of these paintings are remarkably realistic. I must admit however that I like his abstracts much more. These are large scale paintings made with a tool of his own design. 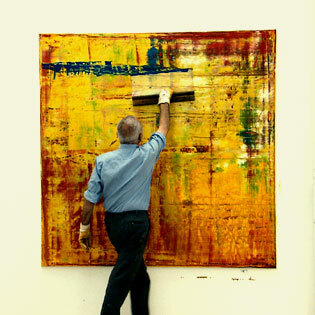 Click here to see a documentary that shows Richter talking about his photographs and at work making some of these large abstracts.